Quality chocolate is a no-brainer, but not original. If you know your valentine well, candy can be very personal, creative and gratifying. A personal favorite of mine. Right as the sugar buzz tapers, the coffee buzz kicks in. However, I am in no way a morning person. It's for anybody that likes coffee. I just discovered fruit leather (they sell it at starbucks). Picture a Fruit Roll Up that tastes better and is made with 100% fruit. It's pretty good. Another option could be taking some strawberry/fruit and lightly drizzling with syrup. Many people who like jelly beans are particular about their flavors. Go to a candy shop that sells Jelly Belly beans separately, and leave out the flavors she/he dislikes. Your valentine will be impressed that you actually listen to their flavor nitpicking. Someone once asked me, while stuffing her face, "Mmmm is there anything better than chocolate filled with caramel?" to which I promptly replied "Yes. Chocolate filled with booze." Okay, diabteic isn't a personality, and cheesecake isn't a candy. But this is my list and I can do what I want. Once again, this almost crosses the line between candy and pastry. You can get mass-produced marzipan in most good candy stores (it's fairly popular). 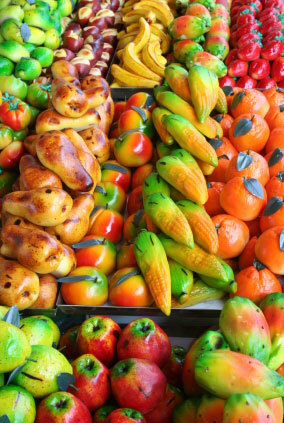 To get fresh made marzipan, you might have to track down an Italian bakery. Marzipan is a soft candy made from almond paste with a texture similar to a brownie. It's sweet (think DiSaronno Amaretto) and to me has a slight cherry flavor to it. A good gift for those with an aversion to the ordinary. Every once in a while I see a candy form my childhood and get giddy and have to buy it. Now imagine someone stuck in the 1990s or '80s (or before!) -- multiply that feeling by 10. You might have to order it online or go to a specialty store to get it, but it could make their day. Yes, they make lollipops, gummy bears, and various other things that taste like cannabis. I don't see how cannsbis would make a desirable food. But to each his own. This may seem obvious, but I wouldn't be suprised if I asked 100 people what to get a chocolate lover and less than half said fudge. And it's not just everywhere you see hand-made fudge shops. The chocolate lover's tolerance is pretty high, so it would take something decadent like a gourmet candy to get them excited. A fudge shop is also usually a mecca for other creative chocolate concoctions. Fudge FTW.